Melanoma in situ refers to stage 0 melanoma, which is the very earliest stage of Melanoma. “In situ” means that the cancer cells are confined to the top layer of the skin and have not spread anywhere else in the body. In stage 0 melanoma, the cancer cells have not yet started to grow into the deeper layers of the skin or become invasive. According to the American Cancer Society, the most important warning sign of melanoma is an existing mole or spot on the skin that is changing in shape, color, or size. This spot may look vastly different from the other spots on your skin. A new lesion on the skin can also indicate melanoma. If you notice any of these warning signs, see your physician at once. Asymmetry: A birthmark or mole (flat or raised) that is not symmetrical. That means that one-half does not match the other. Border: Look for edges that are blurred, notched, ragged or otherwise irregular. Color: The color may include different shades of black or brown. It will usually not have the same color all over. It may sometimes appear with patches of blue, white or pink. Diameter: Any spot or mole larger than about ¼ inch should be checked by a physician. Evolving: A spot or mole that is changing in color, shape or size. If you notice any of the above symptoms, contact a dermatologist right away. Additionally, keep in mind that a dermatologist's eye is going to be much more advanced at detecting cancers. Keep up with your annual or biannual skin checks for maximum protection. 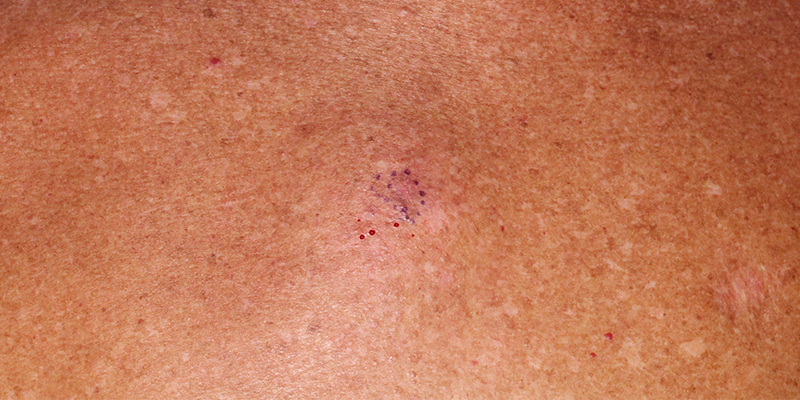 Diagnosis of melanoma in situ will occur with a visual inspection and biopsy of the lesion. If melanoma is found and treated when it is still in the in situ stage, the outlook is excellent. It can be cured if it is cut out completely. According to research, with appropriate treatment, patients with Stage 0 melanoma have an overall survival rate of 99 to 100 percent over a period of 5 to 10 years. This is because lymphatic channels and blood, which are not present in the top layer of the skin, are needed for melanoma to spread. Melanoma in situ must be treated surgically. The surgery for stage 0 melanoma is usually done by a board certified surgeon on an outpatient basis. A surgeon may choose to use Mohs Micrographic Surgery to remove the lesion. This method consists of removing one thin layer of tissue at a time. Once each layer is removed, the physician examines the cells under a microscope to check for the presence of cancer cells. If melanoma cells are present in the margins (surrounding edges of the biopsy), more tissue is removed until the margins are cancer-free. Mohs surgery helps physicians pinpoint the cancer cells, ensuring 100% removal. Patients can help prevent melanoma in situ by practicing sun safety habits, such as: staying out of the sun during peak hours of the day, wearing sunblock, covering up or seeking shade on sunny days, and avoiding indoor tanning beds. It is important to remember that UV ray exposure is a leading source of skin cancer development, but it is not the only source. Even areas of the skin that have had little to no sun exposure can develop skin cancers. Staying up to date on your skin examinations is the best way to catch a potentially hazardous growth. Like most skin cancers, the best way to detect melanoma in situ is to know what to look for. Use the ABCDEs of Melanoma guide when you practice your monthly at home skin examinations, and visit your dermatologist for skin exams regularly. think you have spotted a melanoma in situ? If you think you have spotted a melanoma in situ, call one of dermatologist right away.